The Board of Control for Cricket in India (BCCI) announced Team India's squad for the forthcoming ICC Cricket World Cup which included Kl Rahul and Vijay Shankar, leaving several fans divided with their opinion on the selection. The Board of Control for Cricket in India (BCCI) on Monday announced Team India’s squad for the forthcoming ICC Cricket World Cup which included KL Rahul and Vijay Shankar, leaving several fans divided with their opinion on the selection. While some felt it was the right way ahead to back experience in Dinesh Karthik, others felt it was better had they invested on young Rishabh Pant. On the other hand, KL Rahul’s selection got fans to react as the No 4 spot was creating all the headache, but with good IPL form, Rahul seems to have ensured he made the cut. 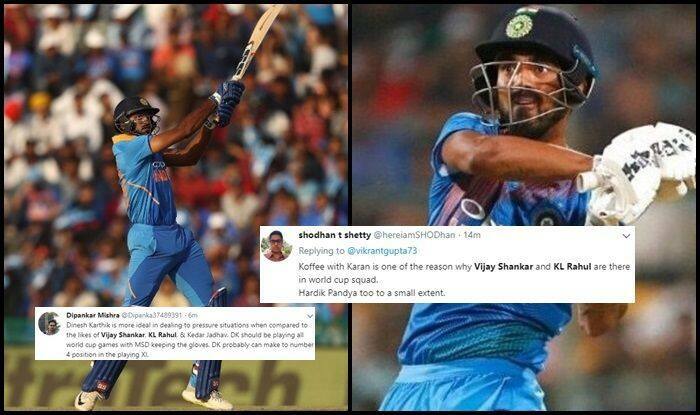 The other reason why Twitter reacted was the selection of the second allrounder as Vijay Shankar was picked. The second wicketkeeper was the sole bone of contention for the marquee event starting in England and Wales on May 30 and the 33-year-old Karthik’s experience of 91 ODIs gave him the edge over the 21-year-old Pant, according to the five-member selection panel headed by MSK Prasad. Karthik, the oldest Indian player in terms of the international debut (three months before Mahendra Singh Dhoni in September 2004), was also part of the Indian squad during its disastrous 2007 World Cup campaign. He, however, missed the bus in 2011 and the 2015 editions. Dinesh Karthik, Kl rahul and Vijay Shankar makes it, whereas Ambati Rayudu and Rishab Pant misses out from the World Cup Squad. Squad: Virat Kohli (C), Shikhar Dhawan, Rohit Sharma (VC), KL Rahul, Mahendra Singh Dhoni (wk), Kedar Jadhav, Hardik Pandya, Vijay Shankar, Kuldeep Yadav, Yuzvendra Chahal, Mohammed Shami, Jasprit Bumrah, Bhuvneshwar Kumar, Dinesh Karthik, Ravindra Jadeja.